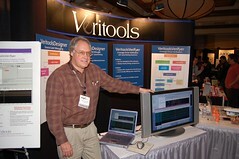 Update February 23, 2007: Updates to quotes from Robert, added info on tool support. So far, Robert has my vote as having potentially the most useful product being demoed at DVCon this year. VeritoolsVerify has the ability to "independently evaluate assertions and coverage", according to Robert Schopmeyer, President of Veritools. In addition, Robert claims the tool supports the same feature set as other competitors in this product category with improved stability and performance. The list price of $4800/seat is quite reasonable, and if the demo is any indication, the tool has excellent performance. The speed at which VeritoolsVerify was able to handle opening large waveform files, open schematic views in large designs, and trace back through levels of hierarchy was amazing. Of course, it was only a demo. According to Robert, the tool is supported on "Solaris 7, 8, 9 and 10 shortly and Linux, Redhat version 3 and 4 on 32 bit platforms and Redhat 3, and 4 on Opteron 64 bit platforms. These are the standard platforms today found in the EDA space... Windows-XP and NT are also supported."